How Do you Pronounce OwyheeStar? Please Note: You will need to send a direct email request to Shela (shela@owyheestar.com) to get the formal application link. It has been said that you are either a Weimaraner person or not. It seems there is little-to-no middle-ground when it comes to this breed. The folks infected with the addiction, appear to be fanciers of a special sort. The Weimar-virus may well be contagious. By all appearances, it spreads to your friends, neighbors, and other family members. That being said, they (the Weimar in general) certainly are not for everyone. Neither are they a leave-in-the-backyard dog. Once they are raised, and well-adjusted this might be possible. The garage scenario is much the same. Good people often fail with this breed for a myriad of reasons. Every year too many Weims find themselves being re-homed. The reason these pups end up being returned to their breeder, dumped at a shelter, or handed off to the rescue organization is more often than not, a misunderstanding about the breed. The Weimaraner presents their new family (or owner) many challenges, and at the same time the dividends for working through the ups-and-downs are huge. You may be a fancier of the Weimaraner, or you may be seeking more information. You may have found your way here during your research process. Whatever has brought you to our website, we welcome you. We sincerely hope you find some answers--the right answers. We have a lot of public information that should help you in your decision-making process. You may want to sign up for our blog--Click Here. 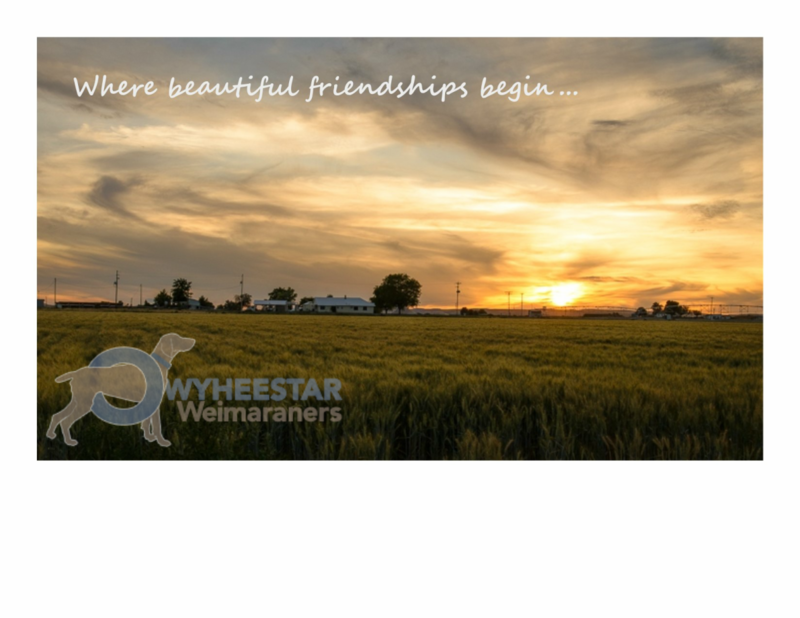 The OwyheeStar Weimaraner's New Blog is a mix of posts: OwyheeStar puppy updates, educational posts, and other breed-related information. In additional, there are pages that talk about the breed, OwyheeStar, and us (the breeders--Cliff and Shela Nielsen). The Weimaraner breed originates in Germany. It was the Nobility of the Court of Weimar who propagated the Weimaraner around the 15th century. These noblemen took pride in developing a dog that held all the prized qualities they deemed desirable--speed, scenting ability, courage, and intelligence. Of course, these Noble-hunters were using them to hunt large game such as wildcats, wolves, deer, etc. The advent of the 20th century brought a decline in the number of the large game. In light of the change, the Weimaraner became known as a bird-dog; however, in actuality they are a versatile hunter. The Versatile Hunter Designation means the hunter can expect them to point game, but also to retrieve upland game birds and waterfowl. In addition, the Weimaraner is used to hunt small game such as rabbits. The breed as a whole has always been protected; they were difficult to acquire. Originally reserved for the nobility, and a few favored others (until very recently) the Weimaraner was beyond the average person's reach. It was difficult, if not impossible to acquire a Weimaraner with breeding rights--both in Germany, and America. This action of guarding the breed (by the breed clubs) was the salvation of the Weimaraner so to speak. Recently, the Weimaraner has seen a rise in popularity. Nevertheless, it is still difficult to find a quality bred Weimaraner. The 21st century continues to see more societal change. Historically families used to be more closely connected to the land, and the environment as a whole. Hunting was a right passage for younger family members. Times have changed, and the society as a whole has evolved. It remains to be seen how this will affect our lifestyle. Some change is for the best, and other shifts are possibly not for the best. When we look back on this changes in mores, we will have a better viewpoint. Today, the vast majority of the Weimaraners raised in America are placed with non-hunters. Just as the 19th century saw the shift from large game hunts to birds (and smaller prey), we see a shift away from hunting. Many of those who are hunters are of the casual type--hunting a few times a year. Nevertheless (even if you are against hunting) it is important to keep in mind that the Weimaraner is and always has been a sporting breed. The OwyheeStar Weimaraner is our passion. We have been working to develop a well-balanced all-around Weimaraner; however, we feel it is important to be true to the breed. We are interested in retaining the natural hunt instinct. Cliff works toward developing hunters, training them and hunt testing them. He is associated with two local hunt clubs, as well as participating in an occasional AKC event. Some of the OwyheeStar Weims have participated in other events--including the show-ring. The focus is on placing every OwyheeStar puppy in the best possible home. We evaluate and match our pups to their future family/or person using our application process. One of our primary goals is to ensure the prospective puppy homes are right for this breed. There are other considerations as well, but ultimately we are looking for people that are like-minded. We require the OwyheeStar puppy be returned to us in the event they are no longer wanted, or cannot be retained. Therefore, we do not take this process lightly on any level. We are first and foremost interested in each pup's welfare. The application is by request only. We are often unable to predict when a puppy will be available. We have written many blogs on this topic, but possible this one is the best--Click Here!